Carolyn Gianettino, 75, started volunteering at UT Health Tyler three years ago after her husband spent several days in the hospital. She was looking for a way to fill her retirement and to give back to her community. Shana Reasor, 23, a UT Tyler student started volunteering at the hospital a year and a half ago under very different circumstances. The full-time student and mother of two said the volunteer hours will help with her ultimate goal of going to medical school. “I feel like I’m getting experience out of it – experience with patients, experience how the operations at the hospital works,” Reasor said. What the two women receive from the hours they spend volunteering, however, is very much the same – fulfillment from serving their community and those who walk through the hospital doors. 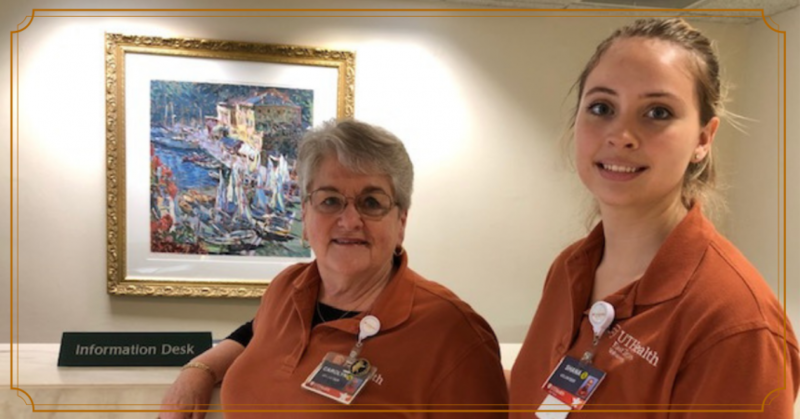 More than 100 volunteers give their time to UT Health Tyler, greeting guests and answering questions at the information desk, transporting patients within the hospital, helping in the gift shop, doing data entry and performing many other tasks. In 2018, hospital volunteers contributed 15,775 hours of service, a gift of time and talents valued at $388,990. Joyce Brown, the hospital’s director of volunteers, said the adult volunteer team consists of men and women ranging from age 18 to senior adults. Thirty-five percent of volunteers are college students who are majoring in healthcare studies and 20 percent are older than 80. Brown said placements are designed to match each volunteer’s passion and interests with the hospital’s needs. “Our volunteers bring energy, happiness and compassion that in turn, they share with people, patients and one another,” she said.